In Russian legalization this document call «Confirmation of hosting a foreign tourist», and according with law formalities this document is necessary for getting tourist visa to Russia. There is a lot of variations of naming it – tourist voucher, letter of invitation, travel confirmation etc. 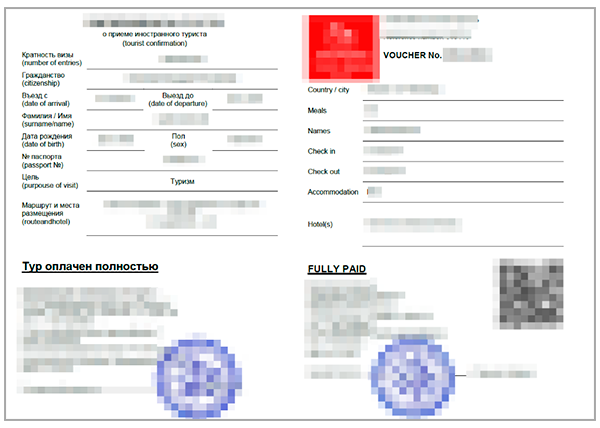 In fact letter of invitation consists of two documents – tourist confirmation and tourist voucher, both of that documents are placed on one sheet of paper. All invitation letters are contain all necessary information about you, your trip, about our company, it sign by authorized person and stamped by our company. For UK citizens voucher (single or double) can be issued for a term up to 30 days and no longer by law. There is 3 official Russian visa centers in United Kingdom – in London, Manchester and Edinburgh. Their staff is very helpful and polite. And in case they find some mistakes they allow to fix it. So there is no real stress in getting Russian visa with your travel voucher. Our voucher for UK citizens cost just for 8.99 GBP, and processing time is up to 1 hour (average processing time is 15-20 minutes). Within one hour we will send you your invitation and invoice.